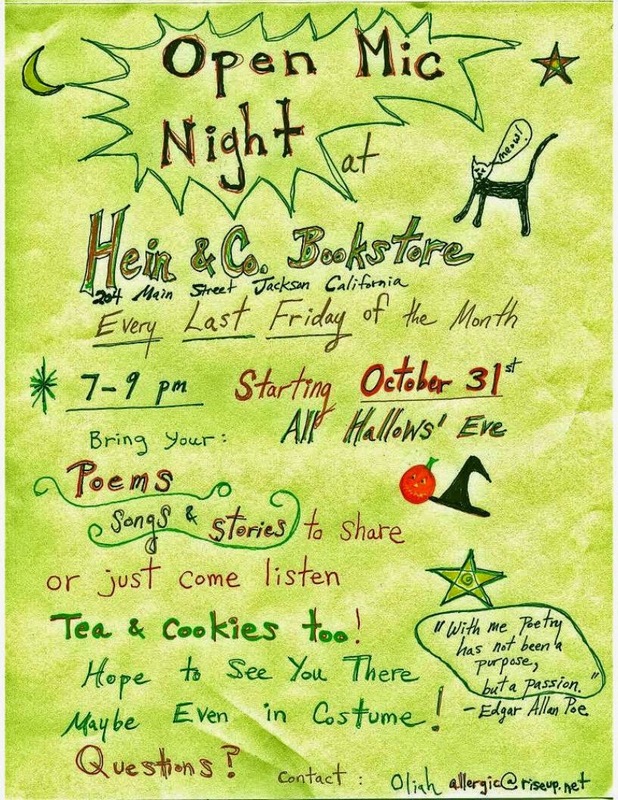 Gallery 10 will honor local artist Ted Smith as its November Artist of the Month. For years Ted painted local and distant scenes in impressionistic and realistic styles, a few of which will be in his show. Recently, Ted expanded his creative talent into exploring abstract paintings. Using vivid color in a variety of media has provided him an outlet for greater self-expression. 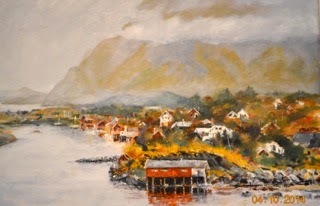 Mr. Smith has been painting for the better part of his 79 years beginning with scenes from his Monterey Bay birthplace. Painting is "in his blood" as his grandfather, an accomplished artist, was his first mentor. Upon retiring from teaching, Ted has been influenced by studying under painter Howard Rees and participating in workshops with Barbara Neches, Lynn Slade and Jeannie Vodden. He shows with the Art in Public Places Program and has won numerous awards at the Amador County Fair Art Show. For Ted, facing a blank canvas "is always a challenge" and finishing a painting that satisfies him emotionally is a great experience. Ted's studio serves as his painting space as well as the storing of found objects and artistic supplies he enjoys collecting. It also functions for his expert framing business of more than 30 years. Gallery 10 invites you to meet with one of Sutter Creek's local characters at a reception in his honor on Saturday, November 1, between 2 and 5 pm. Appetizers, wine and/or punch will be served. 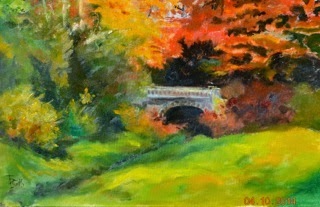 For more information call the gallery at 209-267-0203 or visit the website at gallery10suttercreek.com. Hours are 11 am to 5 pm Wednesday through Monday. The gallery is located at 15 Eureka Street, just off Main and next to Susan's Place. Gates open at 6:30pm for picnics. Show starts at8:00pm. It's never too early to get started on holiday shopping! MSTW Gift Certificatesmake great Christmas presents. You can order online at www.mstw.org. Allow two weeks for delivery. Live Radio Show "Treasure Island"
Treasure Island, featuring his acting troupe, The Mercury Theatre On The Air. On October 24, 25, and 26, Main Street Theatre Works is re-creating the literary radio classic with a live stage production, the fourth in our series. This limited-engagement fundraiser for the company will have two evening performances. Performance Dates and Times at left. Tickets are $25 and include dessert and coffee or tea. There's also a no-host wine bar Friday and Saturday nights. Treasure Island was the second weekly episode of the American Radio drama anthology series, performed by the Mercury Theatre Players, directed and narrated by little known actor and future filmmaker, Orson Welles. The episode was an adaptation of the novel, condensed into a 60-minute broadcast. The War of the Worlds (2 years in a row) and Dracula ~ will have MSTW's production adhere to the same time constraints, same script and live sound effects, just the way Orson would want it. Other cast members include Julie Anchor, Ernesto Bustos, Paj Crank, Richard Williams, and introducing Ben Matta as the young Jim Hawkins. Join us for a fun flashback to the days when people "watched" their radios, and sound effects didn't come from a computer. Come watch how the magic is really made and support Main Street Theatre Works at our fall fundraiser. For more information and to purchase tickets to this Limited Engagement Event, visit the MSTW website atwww.mstw.org. Seating is very limited and this event is sure to sell out, so get your tickets early. summer's smash hit, The Golden State, takes a comical stab at this horror classic. While Wilson's play will keep you on the edge of your seat, it's not because you're dying of fright, but because you'll be dying of laughter. TheSan Francisco Examinersays, "An evening of exhilarating entertainment...An inventive, original comedy of horrors." Chemical Imbalance: A Jekyll and Hyde Play runs every Friday andSaturday, June 19th - July 18th. Written by Christopher Durang, this engaging comedy is the winner of the 2013 Tony Award for Best Play, as well as numerous other industry awards. It's a hilarious spoof on several of Anton Chekhov's best known characters, but you don't need to be a Chekhov fan to enjoy this zany comedy. Vanya and Sonia live in the quiet farmhouse where they grew up, but their peaceful life is turned upside down when their movie star sister, Masha, returns unannounced with her new boy toy, Spike. "Riotous! The kind of full-on comedy that's rare on Broadway!" saysThe New York Post. Vanya and Sonia and Masha and Spike runs August 7th - September 5th. It's that time a year again to say Thank You to all of our wonderful volunteers for all of their invaluable help throughout the year. It was a particularly trying year for me. Breaking both wrists (at different times) and then losing my brother suddenly, created quite a challenge for the rest of the MSTW staff and volunteers. I can't thank everyone enough for their willingness to jump in and get things done! It's because of our wonderful group of volunteers that we are able to forge on when emergencies happen. We had many new actors join us this season and everyone of them was delighted with their experience at MSTW. We hope they will be back again soon. I would also like to offer a special thanks to Scott Adams, who jumped in and took over the directing job of Tartuffe after my first broken wrist, and Pat Formigle who was an angel to jump in and take on the set for The Golden State after the second broken wrist. You are both very special and did a great job! On September 21st, we had a wonderful picnic supper at the amphitheatre for all of our volunteers and performed short scenes from 4 plays that were under consideration for our 2015 season. This has become a yearly event and is enjoyed by all, so if you missed it this year, don't forget to join us next September - we'll be doing it again. If you would like to get involved, we welcome your help. Please contact Frannie Weinrob (fran4029@aol.com) and let her know that you'd like to find a niche for yourself at MSTW. It's a great way to meet new friends and help the company thrive. I cannot say enough about the wonderful group of people who continue to help us every year. We look forward to working with you next season and welcome anyone who'd like to join us. The Mother Lode Friends of Music, the regional organization of classical music performance serving the central region of the gold country, presents its first concert of chamber music in the new season on Sunday, November 2, starting at 2 pm in the Church of the Nazarene, 14050 Ridge Road, in Sutter Creek. The concert is free and open to the public. 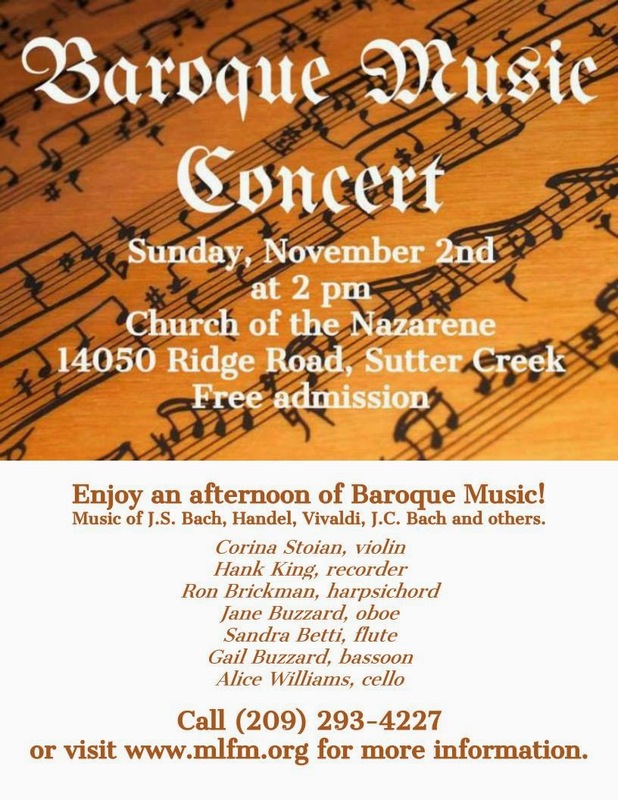 The concert is devoted to music of the Baroque era and presents seven of the organization’s top performers: Corina Stoian on violin, Ron Brickman on harpsichord, Sandra Betti on flute, Hank King on recorder, Jane Buzzard on oboe, Gail Buzzard on bassoon and Alice Williams on cello. The concert opens with the dazzling Sonata in D for violin and harpsichord by Jean-Marie Leclair, famous throughout musical history for its final movement “Le Tambourin” (The Tambourine), performed by Stoian and Brickman. Hank King, with Brickman and Williams, performs the enchanting Recorder Sonata in A minor of Georg Fridiric Handel. The first half concludes with the majestic Trio Sonata in D minor of Johann Sebastian Bach, performed by Betti, Jane and Gail Buzzard, and Brickman. The second half of the program opens with the charming Trio Sonata in C for Recorder and Flute, with bassoon and harpsichord accompaniment, by Johann Joachim Quantz. It is one of the rare works of Baroque music featuring both the recorder and the flute. The grand Chamber Concerto in G minor of Antonio Vivaldi follows, with six of the seven instruments represented: recorder, oboe, violin, bassoon, cello and harpsichord. The concert continues with the Quintet in D of Johann Christian Bach, one of J. S. Bach’s sons who incorporated elements of Baroque music into the musical ideas of the emerging Classical era. In this work, both the harpsichord and cello are retained as accompaniment instruments but are also given solo passages. The selection presents many of the refreshing innovations of classical music, including the emphasis on melody and chordal rather than contrapuntal accompaniment, conveying the overall delicacy and graciousness that marked the era. The concert concludes with a contemporary work for violin and harpsichord by Japanese-American composer Asako Hirabayashi, combining both modern romanticism and brilliant virtuosity in both instruments. All players are familiar to classical music lovers in the Mother Lode. International concert violinist Corina Stoian has become one of the Friends of Music’s most popular performers since her U.S. debut in 2008. Now living in the San Francisco Bay Area, she performs regularly in the Friends of Music’s concert series and serves as concert master of the organization’s orchestra. All the other players live in local communities and are prominent participants in the area’s musical scene. For further information, call (209) 293-4227 or go to www.mlf.org. summer's smash hit,The Golden State, takes a comical stab at this horror classic. While Wilson's play will keep you on the edge of your seat, it's not because you're dying of fright, but because you'll be dying of laughter. The San Francisco Examiner says, "An evening of exhilarating entertainment...An inventive, original comedy of horrors. "Chemical Imbalance: A Jekyll and Hyde Play runs every Friday and Saturday, June 19th - July 18th. Written by Christopher Durang, this engaging comedy is the winner of the 2013 Tony Award for Best Play, as well as numerous other industry awards. It's a hilarious spoof on several of Anton Chekhov's best known characters, but you don't need to be a Chekhov fan to enjoy this zany comedy. Vanya and Sonia live in the quiet farmhouse where they grew up, but their peaceful life is turned upside down when their movie star sister, Masha, returns unannounced with her new boy toy, Spike. "Riotous! The kind of full-on comedy that's rare on Broadway!" says The New York Post. Vanya and Sonia and Masha and Spike runs August 7th - September 5th.